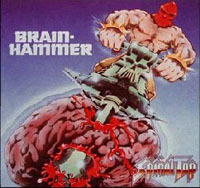 Brainhammer (Megaphone, 1970): Taps fourth album, rated A by Entertainment Weekly. "The band hits its lumbering stride, moving with a lean, mean aplomb of a brontosaurus in fighting trim." Includes the anthem/tribute "Big Bottom," which "brilliantly foreshadows Queens later, lesser ode to the bum cheek, Fat-Bottomed Girls. " Also includes the rocking "Lie Back and Take It" and the sultry "Swallow My Love." (IST) Fans should note that the liner notes on the "This is Spinal Tap" soundtrack are in error when they list release of "Big Bottom" as 1973. It was released on the 1970 album "Brainhammer." See Punk rock.